For other uses, see Order of Friendship (disambiguation). The Order of Friendship is awarded to Russian and foreign nationals for special merit in strengthening peace, friendship, cooperation and understanding between nations, for fruitful work on the convergence and mutual enrichment of cultures of nations and peoples; for the active conservation, development and promotion of the cultural and historical heritage of Russia; for great contribution to the implementation of joint ventures with the Russian Federation, major economic projects and attracting investments into the economy of the Russian Federation; for broad charitable activities. The badge of the Order of Friendship is made of gilded silver and enamels. It is a pentagonal star created from diverging golden rays. On the obverse at the center of the star is a terrestrial globe, with the oceans covered in blue enamel. The globe is surrounded by a green enamelled wreath of olive branches. On the reverse is the inscription "Peace and Friendship" (Russian: "Мир и дружба") and the etched serial number of the individual award. The distance between opposite tips of the star is 44 mm. 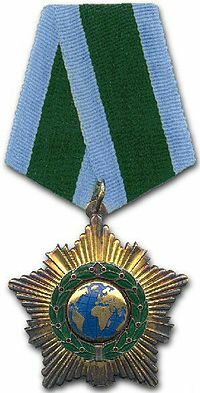 The badge of the order is connected by a ring through the suspension loop to a standard Russian pentagonal mount covered with an overlapping 24 mm wide green silk moiré ribbon with 6 mm wide light blue stripes along its edges. 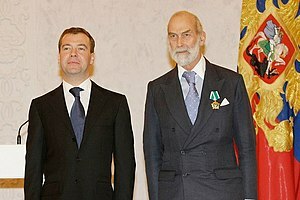 When worn in the presence of other Orders and medals of the Russian Federation, the Order of Friendship is located immediately after the Order of Honour. ^ a b c d "Decree of the President of the Russian Federation of 2 March 1994 No. 442" (in Russian). Commission under the President of the Russian Federation on state awards. 15 December 1999. Archived from the original on 18 February 2001. Retrieved 11 February 2012. ^ "Decree of the President of the Russian Federation of 6 January 1991 No. 19" (in Russian). Commission under the President of the Russian Federation on state awards. 15 December 1999. Archived from the original on 18 February 2001. Retrieved 11 February 2012. ^ "Decree of the President of the Russian Federation of 7 September 2010 No. 1099" (in Russian). Russian Gazette. 7 September 2010. Retrieved 7 February 2012. ^ "Decree of the President of the Russian Federation of 16 December 2011 No 1631" (in Russian). Russian Gazette. 16 December 2011. Archived from the original on 31 March 2013. Retrieved 7 February 2012. ^ a b "Decree of the President of the Russian Federation of 16 March 2012 No. 308" (in Russian). Consultants, legal library of Russia. 16 March 2012. Retrieved 11 May 2012. ^ "Decree of the President of the Russian Federation of 12 April 2012 No. 433" (in Russian). Russian Presidential Executive Office. 12 April 2012. Archived from the original on 5 August 2013. Retrieved 19 April 2012. ^ "Compiled from the site of the President of the Russian Federation" (in Russian). Kremlin News. Retrieved 7 February 2012. 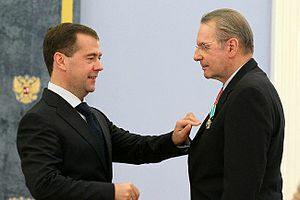 ^ "PM receives Russia's highest award". The Star. 6 August 2003. ^ a b "Медведева, Загитова, Большунов, Спицов удостоены Ордена Дружбы" (in Russian). sports.ru. 28 February 2018. ^ a b c d Vladislav Dunaev (19 April 2001). Консульство в Сан-Франциско чествует исследователей - Энтузиасты Русской Америки получают ордена Дружбы [Consulate in San Francisco celebrates researchers - Enthusiasts of Russian America to receive the Order of Friendship] (in Russian). Nezavisimaya Gazeta. Archived from the original on 14 January 2005. Retrieved 12 March 2010. ^ Berthiaume, Lee (5 March 2014). "From Russia with Love: Chretien gets friendship award from Moscow". o.canada.com. ^ "Meeting with Patriarch Ignatius IV of Antioch and All The East". Eng.news.kremlin.ru. 11 May 2010. Retrieved 18 January 2016. ^ Wroe, Nicholas (16 July 2010). "Victor Hochhauser: 'My great stroke of luck came when Stalin died'". Retrieved 24 March 2019 – via www.theguardian.com. ^ "Jayakanthan awarded Order of Friendship award". ^ "Jayakanthan awarded Order of Friendship". ^ Hoe, Yeen Nie (16 November 2009). "Russia, S'pore move towards closer ties with new governmental body". Channel NewsAsia. Archived from the original on 6 December 2012. Retrieved 12 March 2010. ^ "Former Vatican Ambassador to Russia is decorated with Order of Friendship". interfax-religion.com. 18 February 2010. ^ Adam Sweeting (16 March 2011). "Riccardo Muti: a profile". The Telegraph. Retrieved 23 April 2011. ^ "God Nisanov WJC Vice-President". World Jewish Congress. Archived from the original on 9 February 2015. Retrieved 9 February 2015. ^ "Russia honours BrahMos chief with 'Order of Friendship' award". Business-standard.com. Press Trust of India. 26 February 2014. Retrieved 18 January 2016. ^ "Указ Президента Российской Федерации от 29.01.2016 г. № 29" (in Russian). kremlin.ru. 29 January 2016. ^ Указ Президента Российской Федерации от 22.09.2015 г. № 469 - О награждении государственными наградами Российской Федерации иностранных граждан [Presidential Decree of 22.09.2015, the № 469 - On conferring state awards of the Russian Federation on foreign citizens] (in Russian). Kremlin.ru. 22 September 2015. Retrieved 18 January 2016. ^ "Putin awards Indian director NPP "Kudankulam" Order of Friendship". Russia Beyond The Headlines. 29 January 2016. Retrieved 29 January 2016. ^ "Dr Rowan Williams is honoured for work on Russia". BBC. 12 March 2010. Retrieved 12 March 2010. ^ "Vladimir Putin Awards Rescuers in Latok I Epic". Gripped Magazine. 2018-09-05. Retrieved 2019-01-19. ^ a b c "Vladimir Putin Awards Rescuers in Latok I Epic". Gripped Magazine. 2018-09-05. Retrieved 2019-03-07. 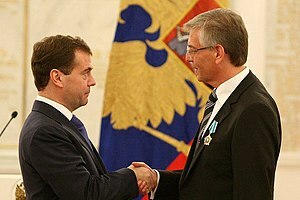 Wikimedia Commons has media related to Order of Friendship (Russia).